It has long been illegal for a runner to take a flying start from behind a base when tagging up, and, although the prohibition has been listed under 5.09 Appeal Plays, there remained a question on when and how a runner would be declared out under this rule: should it receive the "automatic out" standard ordinarily reserved for a runners-passing play or is it an appeal subject to a time play, as colloquially enforced? Answer: The Playing Rules Committee added a sentence (underlined) to make it clear: "A runner is not permitted to take a flying start from a position in back of his base. Such runner shall be called out on appeal." Returning & sliding alone are not interference. On July 15, 2017, Yankees baserunner R1 Matt Holliday, retired at second on a force play, slid back into first base as Red Sox fielders attempted to make a play on the batter-runner at first. Due in great part to Holliday's slide, which physically separated Red Sox first baseman Mitch Moreland from the thrown ball, batter-runner Jacoby Ellsbury was ruled safe at first base by 1B Umpire Gabe Morales, who ruled that Holliday, in simply retreating to first base, was not guilty of retired runner's interference, as in Rule 6.01(a)(5). Boston went as far as to protest Morales' ruling, but as we explained when it happened, the play was legal; a baserunner does not violate retired runner's interference Rule 6.01(a)(5) simply by retreating to a base, even if the retired runner unintentionally hinders the defense. MLB agreed and denied Boston's protest two days later, much to the chagrin of skipper John Farrell, who continued his complaint in the wake of MLB's response that Holliday's play was legal. A similar play had occurred at Angel Stadium in April 2017. Related Post: Case Play 2017-4 - Hurdling a Retired Runner [Solved] (4/30/17). 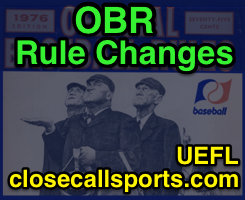 The Playing Rules Committee formally made the play legal this offseason, adding the following phrase to Rule 6.01(a)(5) Comment: "If the batter or a runner continues to advance or returns or attempts to return to his last legally touched base after he has been put out, he shall not by that act alone be considered as confusing, hindering or impeding the fielders." Ball/strike corrections have a formal limit. 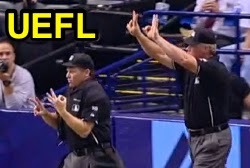 When baseball adopted expanded Replay Review, the league office also enabled its umpires to conduct a Crew Chief Review to check for incorrect ball-strike counts or scorekeeping/recordkeeping matters, ordinarily when a plate umpire missed a pitch or struck out/walked a batter too soon (most often, these "missed counts" resulted in a batter taking five pitches for a walk). Related Post: Discussions: Losing Count & Broadcast Bias (7/1/11). However, baseball forgot to explicitly declare the time limit involved with correcting an erroneous count; the new addendum to Rule 8.02(c) takes care of the timing issue: "Notwithstanding the foregoing, correction of a missed ball-strike count shall not be permitted after a pitch is thrown to a subsequent batter, or in the case of the final batter of an inning or game, after all infielders of the defensive team leave fair territory." 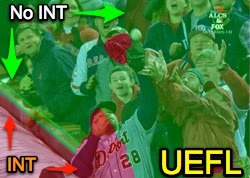 The definition of fan interference has expanded. In 2016, a fan ran onto the field during a July Cardinals-Mariners game while St. Louis batter Matt Carpenter hit a fly ball to Seattle left fielder Seth Smith, who successfully caught the fly ball in spite of the fan running through left-center field toward the shortstop area. According to the fan interference rules in play at the time, if this intruder had distracted or otherwise hindered Smith from making a play on the ball, it would not be interference unless the fan physically touched Smith or the baseball. Related Post: Case Play 2016-4 - Fan on the Field [Solved] (6/30/16). During the 2016 AL Wild Card between the Blue Jays and Orioles, a Toronto fan threw a beer can at Baltimore outfielder Hyun Soo Kim as he caught a descending fly ball. Similar to the fan-on-field Cast Play, this distraction, according to the rules at the time, would not constitute spectator interference unless the fan actually touched the ball or player in reaching out of the stands. Related Post: Discussion of 2016 AL and NL Wild Card Games (10/4/16).